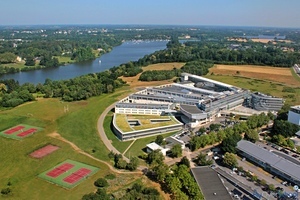 Located in the north of Nantes on the banks of the Erdre river, Nantes campus is located in an area entirely dedicated to advanced technologies with high-tech companies and several Higher Education Institutes and Research centers. It reflects the dynamism of Nantes, the 6th largest city in France with a fast expanding economic development, pleasant environment and rich cultural activity. The campus includes research departments and educational facilities on modern buildings spread over a 15-hectare site. 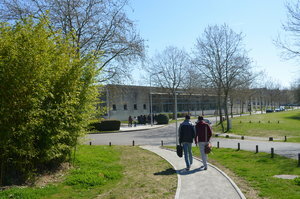 Furnished and individual rooms are available for students on Nantes campus. The student's residence is called « Maison Des Elèves » in French, or "MDE". 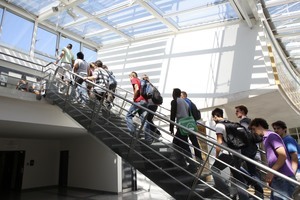 Once admitted into a program on Nantes campus, you can contact the MDE administration and book a room online. More than 600 individual rooms and couple rooms are available ! Once registered at the MDE, you will receive an accomodation certificate which is a necessary document for the visa application (student's visa process obligatory for non-European students). If you come from outside Europe, you will probably have to transit through Paris. 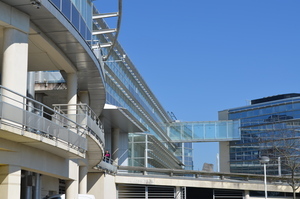 There are 2 airports in Paris: Charles de Gaulle (CDG) and Orly . You can take a plane to Nantes Atlantique airport (NTE) from these 2 airports, the flight takes about 1 hour. There is a train station just under Paris CDG airport. After landing at CDG airport, you just have to follow the direction “TGV” (high speed train). Be careful, the airport is huge, you could need up to 45 minutes to walk from your arrival gate to the TGV train station. The Paris CDG-Nantes journey takes about 3 hours. In case you plan to spend a few days in Paris before coming to Nantes, you can take the train from Paris city center, at Paris Montparnasse train station. The journey takes only 2 hours to Nantes. The international Service in Nantes campus can arrange a car to pick you up at Nantes train station/airport if you let us know your arrival schedule at least 5 days ahead.